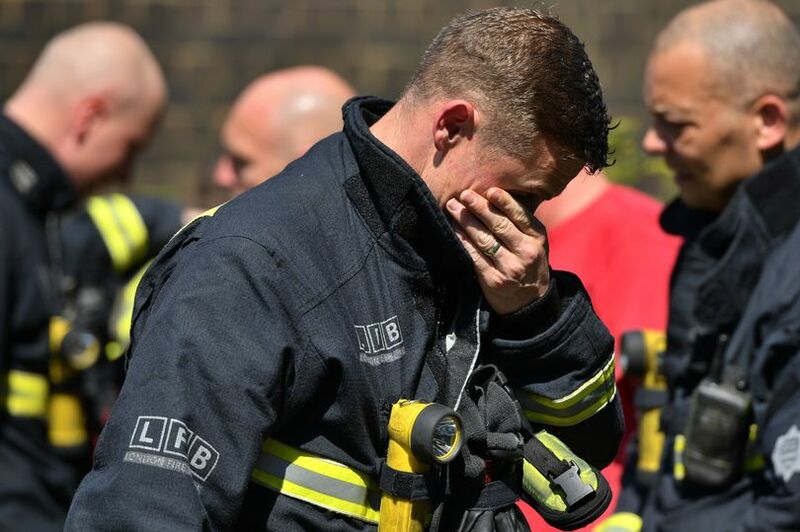 Grief: Firefighters found it hard to keep themselves together as they dealt with the tragedy at Grenfell Tower. [Image: PA]. What a great announcement by the Fire Brigades Union – this has put the official inquiry on notice that it will not simply judge; it will also be judged. Firefighters who were called to the Grenfell fire were deeply affected – emotionally – by what they found there. If anybody is likely to know whether corners were cut and regulations that should have been followed were ditched instead, they will. And they will make their point forcefully. Perhaps one reason for this is the government’s treatment of firefighters themselves. It isn’t very long since firefighters were staging strikes about Tory-imposed changes to their pension entitlements. The Conservatives unilaterally imposed a rise in the level of contributions firefighters must make to their pensions, meaning they would have less pay in their pockets, and they also raised the age of retirement from 55 to 60, meaning fewer firefighters are likely ever to receive a pension as many members may fail the fitness test required to remain on active duty, and would have to leave the service – without qualifying for a pension – as a result. So firefighters have first-hand experience of being given a hosing by the Tories. It’s a joy to see they won’t stand by and let it happen to others. The head of the Fire Brigades Union has described the Grenfell Tower disaster as a “crime” that should topple the government amid warnings over a boycott of the national inquiry. FBU chief Matt Wrack said the tower block fire was a “national political scandal” and called for ministers to be hauled before the inquiry to answer questions about why regulations were cut. The union will walk away from the official inquiry if it is seen by survivors and firefighters as a “pointless stitch up”, Mr Wrack warned. Can some please explain to me just HOW the Grenfell Tower Public Inquiry Panel can reach their goal of their Terms of Reference in the absence of an Interim Fire Report. According to previous press release from the PM’s Office and the Mayors Office an Interim fire report would be published. Without an interim Fire Report the Public Inquiry crashes on take off. The main forensic fire investigation report will not be completed for several years according to Press releases,hence an INTERIM REPORT is paramount for the Public Inquiry. No interim fire report NO Public Inquiry. Well done to the firefighters for not being intimidated.